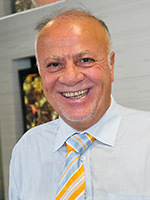 Professor Mike Efthymiou is the Shell EMI Professor of Offshore Structures at UWA who has had a distinguished career within Shell spanning more than 30 years. Mike has played a key role in the development of Shell’s fixed and floating offshore facilities, including gravity-based platforms, TLPs, FPSOs and FLNG. He is a technical authority on turret, moorings, production risers, water intake risers and topsides structural design. Mike is supporting various project streams within the OFFshore ITRH.